Build loyalty into everyday business. Simple programs that build loyalty and drive repeat visits. The Moneris Gift Card Program allows any sized business to sell custom designed gift cards. Now you can offer the perfect gift for any occasion – from the holidays to a birthday, anniversary or even Hug Your Boss Day. Plus you can boost your sales at the same time. 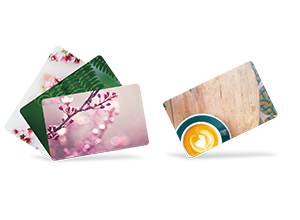 Create your own custom design or choose from one of our unique card designs. Or if you need design assistance, just call us. Minimum order of only 200 allows for any business to benefit from customized gift cards. Get your custom designed gift cards within 1 week 1. Works on your existing Moneris POS terminal, so you don’t have to add any equipment to incorporate the program into your business. Did you know 59% of Canadians have gift cards at the top of their holiday wish list 2? "Finding the right style is what I do for a living, and it’s what my customers count on me for. Moneris made picking the right design for my gift cards easy. And I didn’t have to stick to one style either – it was easy to order multiple custom designs so I could have different looks." 1. Maximum delivery time of one week from date artwork approval is received. Must provide a valid address and be available to sign for package containing Gift Card order. Orders with non-standard card printing specifications or exceeding 5,000 Gift Cards may require additional time. 2. Source: Maru/Blue, Canadian Omnibus Online Survey, August 2018. The Moneris Loyalty Program is designed to give customers the best options and keep them coming back. It drives incremental sales, attracts and retains customers, and provides unique insights. It’s a loyalty program that’s practical and accessible for businesses of all sizes, including yours. Choose the Moneris Loyalty Card that best suits your business needs. Easy to use and with a straightforward setup, the Basic Loyalty package includes everything you need to get running quickly. The Enhanced Loyalty Package offers more features and flexibility to tailor your loyalty program for your multi-location business needs. Make the most of your loyalty program with some tips and tools. Download the brochure that's right for you.